Most of José Pizarro's recipes use admirably few ingredients. Recipes can, I think, display a lack of confidence when lists are too long. 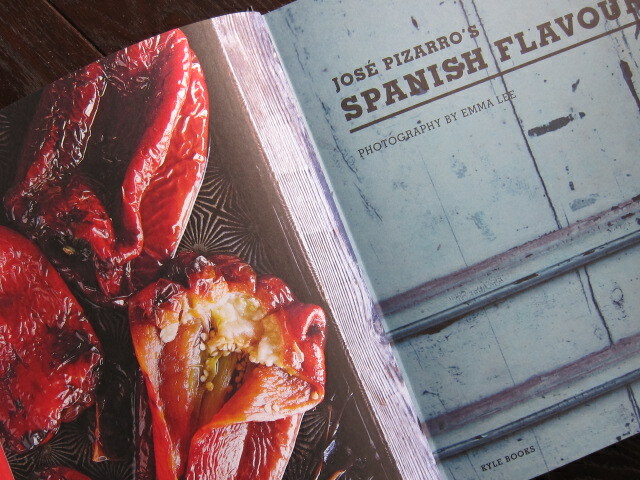 There is no such problem with those in Spanish Flavours, or in Pizarro's first book Seasonal Spanish Food. Seeing Spain, from a culinary point of view, as many countries rolled into one, he has organised the book into five chapters covering North, East, Centre, South and the Balearic and Canary Islands. It's not an original concept but it works. Fish and seafood, of course, plays a major role throughout Spanish cuisine but regional specialities are brought into the mix and inspire these recipes. Pizarro is also happy to credit his present home, London, where he owns restaurants José and Pizarro, as an influence on how he uses certain ingredients. The North of Spain, which has high rainfall, is a dairy and farming region so as well as Griddled scallops with cauliflower puree and chorizo oil, there is a recipe for Baked cheesecakes with blueberries. The East is rich in funghi, game and rice, demonstrated by Caldoso (meaning soupy rice) with quail, wild mushrooms, artichokes and black olives. The Centre is where Pizarro is most at home, being a son of Extramadura. Peppers, tomatoes, potatoes, saffron, and Manchego cheese are celebrated along with the products from the magnificent Iberico pig and Jamόn de Teruel. A recipe for Braised Iberico pork with tomatoes, chorizo, thyme and black olives is the region personified. The South has the Moorish influences represented here in dishes such as Spicy lamb albondigas, a take on kofta meatballs, flavoured with North African favourites cumin and coriander. The final region is the Islands, where Pizarro found "simplicity, freshness and strong flavours" summed up the cuisine, inspiring dishes such as Lobster caldereta (stew) and Avocado with prawns and tomato vinaigrette. Puddings throughout rely heavily, and deliciously, on fruit. Even the Spanish version of eggy bread manages to incorporate some orange. Almond and honey creams with lemon verbena peaches and Orange-scented apple buñuelos are must-trys. The atmospheric photography by Emma Lee successfully captures the rustic style of the dishes and the little explanatory drawing in the introduction is delightful. This book certainly makes me want to get cooking - Braised peas and Jamόn with eggs, perhaps.